14k Yellow Gold White Gold Heart Birthstone Diamond Halo Dangle Earrings 0.9"
14k Yellow Gold White Gold Round Birthstone Diamond Halo Dangle Earrings 0.9"
These cute dangle drop flower shaped stud earrings are sparkled with white zircon gemstones and safely secured with baby screwback closure. Being an April birthstone white zircon makes a great gift for Aries and Taurus zodiac signs. Double Heart Dangle Huggie Hoop Earring. These beautiful dangle open heart earrings are crafted in 14k solid yellow gold and sparkled with round cut white zircon gemstones for extra shine. Dangle (Drop). Double Heart Dangle Huggie Hoop Earring. These beautiful dangle open heart earrings are crafted in 14k solid white gold and sparkled with round cut white zircon gemstones for extra shine. Dangle (Drop). 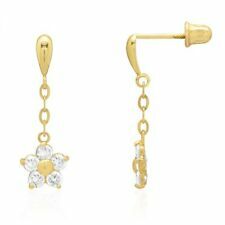 These dazzling dangle stud earrings are designed with round cut white zircon gemstones forming a flower. The earrings are crafted in 14k solid yellow gold and safely secured with baby screwback closure. 14k Yellow White Gold Birthstone Teardrop Diamond Halo Dangle Earrings 1"
These stunning dangle earrings are decorated with heart shaped bezel set white zircon and carefully secured with lever back closure. The earrings are finished in 14 solid white gold. Being an April birthstone white zircon makes a great gift for Aries and Taurus zodiac signs. 14k Yellow Gold Birthstone Virgin Guadalupe Oval Dangle Leverback Earrings 1"
These beautiful dangle stud earrings feature a pear shaped white zircon gemstone accentuated in illuminating round cut zircons, the earrings are finished in 14k solid yellow gold and safely secured with baby screwback closure. These beautiful dangle stud earrings feature a pear shaped white zircon gemstone accentuated in illuminating round cut zircons, the earrings are finished in 14k solid white gold and safely secured with baby screwback closure. These dazzling dangle stud earrings are designed with round cut white zircon gemstones forming a flower. The earrings are crafted in 14k solid white gold and safely secured with baby screwback closure. 5A highestquality diamond cut Cubic Zirconia (CZs). Customizeyour dream jewelry. 5A highestquality diamond cut Cubic Zirconia (CZs). C ontact Us. Product ID. 29mm ~ 1 1/8". 17mm ~ 5/8". 8.10 grams. Red Garnet Teardrop Dangle Earrings 14k Yellow Gold. 14k yellow gold earrings with 7/10mm teardrop Red Cubic Zirconia. Two tone rings from 925 sterling silver and gold 9k or 14k. 14k gold jewelry. Earrings, necklaces and diamond rings. Elegant Italian 18ct gold filled epoxy blue zircon gemstones dangle drop earrings. 18ct Gold Filled. 35mm x 12mm. Zircon INFORMATION. Zircon and Created Sapphire. Component Stones Fifteen years ago he started the Charles Hollander Collection producing prestigious objects made out of gold and diamonds. Our quality is unsurpassed and all of our collections cater to the latest fashion trends. Zircon INFORMATION. Zircon and Topaz. topaz INFORMATION. Swiss Blue. Component Stones Fifteen years ago he started the Charles Hollander Collection producing prestigious objects made out of gold and diamonds. Zircon INFORMATION. Zircon and Topaz. topaz INFORMATION. Swiss Blue. Blue and Swiss Blue. Solid 14K White Gold. Oval and Round. Our quality is unsurpassed and all of our collections cater to the latest fashion trends. Zircon INFORMATION. Zircon and Topaz. topaz INFORMATION. Swiss Blue. Solid 10K White Gold. Blue and Swiss Blue. Oval and Round. Our quality is unsurpassed and all of our collections cater to the latest fashion trends. Zircon INFORMATION. Zircon and Created Sapphire. Solid 10K White Gold. Oval and Round. Our quality is unsurpassed and all of our collections cater to the latest fashion trends. Fifteen years ago he started the Charles Hollander Collection producing prestigious objects made out of gold and diamonds. Zircon INFORMATION. Zircon and Created Sapphire. Solid 925 Sterling Silver. Oval and Round. Our quality is unsurpassed and all of our collections cater to the latest fashion trends. Fifteen years ago he started the Charles Hollander Collection producing prestigious objects made out of gold and diamonds.